You probably have a day pack in your closet for short hikes, trips to the pool, and outdoor activities like music festivals, and you probably hate using it. Sure, it’s nice to have something lighter than a backpack, but that lightness usually comes at the expense of features that actually make a bag tolerable to carry, like padded shoulder straps, and structure. Enter Air Pack, a water-resistant CORDURA day pack with an inflatable back cushion and straps. Deflated, it weighs almost nothing and can roll up really small. But with a few puffs of air, Air Pack will cushion your back from all the spiky contents inside the bag, and take some strain off your shoulders too. A variety of straps and buckles add extra support, and let you adjust the Air Pack’s positioning just like a “real” backpack, but without the bulk. 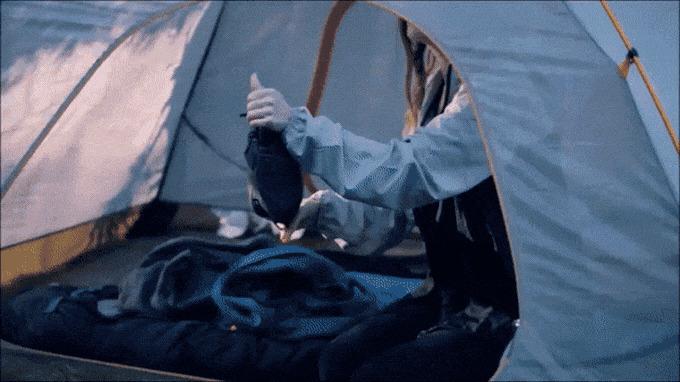 Would you want to pack for a three day camping trip in the Air Pack? No. But it’s a really convenient and comfortable way to carry a couple water bottles and a change of clothes around for a few hours. Preorder it for $79 (or a more waterproof version for $95) on Indiegogo, with shipping expected in February.